If you should happen to need a dehydrator this season, know that we carry a large variety of dehydrators, in all price ranges, from entry-level level models to high-end professional models. Right now, we’re having a lot of fun testing Excalibur’s stainless steel model, which is the Mercedes of all dehydrators. It’s huge, like a major appliance, and has ten trays, a digital control thermostat, and a 48 hour timer. Not only is this unit stainless steel inside and out, but it has convenient glass doors instead of the the hinged or hanging doors on other models. It also has the ability to operate at lower temperatures than an oven and can easily maintain the recommended 105 degrees. In fact, you can even use it to keep yogurt warm during the fermenting process. Be aware, though, that the fan can sometimes seem a bit loud. If you’re especially sensitive to noise, you might want to keep it in an out-of-the-way place. We keep ours on a table with wheels, which makes it easy to load in the kitchen. When full, we roll it out to our drying area for dehydrating. And, it’s so energy efficient. We love it! This particular dehydrator costs $999.95, but shipping is free, and for someone who needs an American-made industrial workhorse, this machine is da bomb! Now is the perfect time to get one, because we are offering a 5% discount on all products store wide through the end of October, which amounts to about $50 in savings on this unit alone! Just enter the coupon code READ45 at checkout. 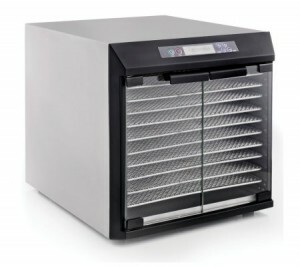 Of course, we carry smaller, more conventional dehydrators, too. Even though they’re relatively inexpensive, folks like them a lot because they’re reliable, well-designed, and do a good job of dehydrating all types of foods. The Nesco American Harvest Gardenmaster Digital Pro Food Dehydrator with the top-mounted fan that eliminates liquids dripping into the heater chamber is one of our most popular models, also made in the U.S.A.
We’re so lucky nowadays to have more tools available to us than our grandmothers did. We carry a variety of tools that are so helpful in preparing foods for dehydrating. Peelers, slicers, corers, and shredders make the work so much easier and faster. There are all sorts of nifty kitchen gadgets on the market now, and we recently added some of the best tools we could find to our catalog. 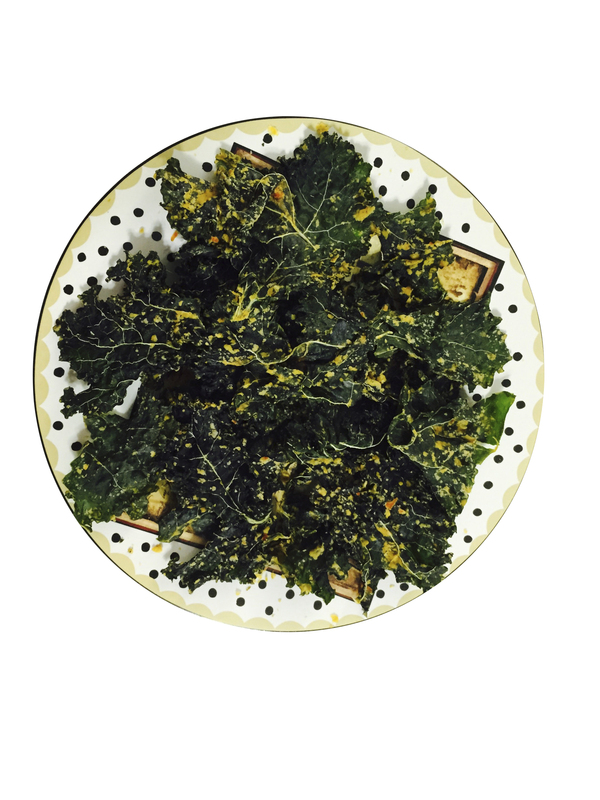 When dehydrating, you want to cut your food into slices of the same thickness, usually not more than 1/4″. So investing in a slicer can be a good idea. Fleshy foods like tomatoes can be cut in half or quarters. If you’ve ever tried preserving peaches, you know what a pain it is to get the stones out without ending up with a mess. Unless it’s a freestone peach, forget it, right? 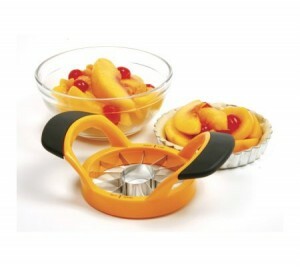 Well, now there’s a stainless steel peach corer and wedger gadget that takes the stone out for you and cuts the peach into 12 neat slices at the same time! Our stainless steel apple corer works in a similar way. Both of these tools have a comfortable, non-slip grip. We have a banana slicer, too. You might think slicing a banana isn’t all that difficult, but if you’re cutting them by hand, it’s hard to make all the slices the same size. If you’re dehydrating, however, it’s important that all the pieces be of uniform size so everything dries at the same time. 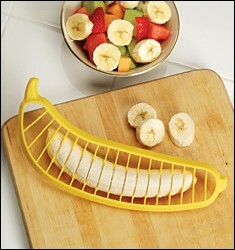 A banana slicer makes the job so much faster, and is easier on your hands, too. Jerri’s all-time favorite kitchen tool is the Professional Salad Shooter. Don’t let the name fool you. This gadget is powerful and comes in handy for prepping many different types of foods, not just salads. It’s fun to use and helps to make slicing harder veggies like carrots a breeze. 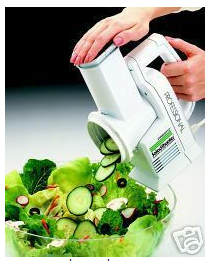 Our Salad Shooter can slice or shred most veggies, fruits, and cheese. It has a large food chamber that’s big enough to hold a whole potato! Four interchangeable cones let you cut the food into different shapes and sizes–thin slices, thick slices, ripple cuts, or shreds. 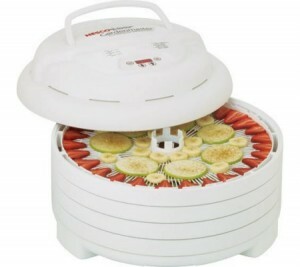 A Professional Salad Shooter is the ultimate companion to your dehydrator! If you have a lot of meat on hand and want to make your own jerky, you’ll probably need some jerky making equipment, like a special cutting board and knife to make perfect slices, or a jerky gun to make strips or sausage. Our jerky gun even comes with seasoning! Did you know you can make jerky without a dehydrator, too? 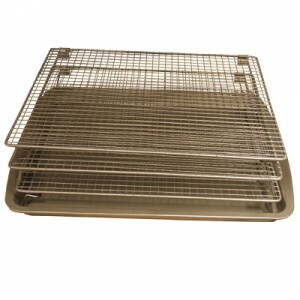 This Weston three-tier drying rack can be used to dry jerky in the oven, without making a mess. Bonus: You can use it as a smoking rack, too! You’ll want to rotate your trays during the drying process. Even though your dehydrator has a fan, the air doesn’t always circulate evenly. Moving the bottom trays to the top and the top trays to the bottom about halfway through the drying process ensures everything dries evenly. When dehydrating fruit, be sure to finish one batch before adding more fruit. Otherwise, the partially dehydrated fruit will reabsorb moisture from the fresh fruit. It’s fine to dry several types of fruit at the same time, however. Make sure the food is thoroughly dry before you store it. If you put it in a Ziploc bag or other airtight container and notice dampness or droplets of water forming inside, remove the food immediately and return it to the dehydrator until all the moisture has been removed. Storing food that has been only partially dehydrated can cause dangerous mold to grow on the surface. Fruits and veggies can be dried until crispy or chewy, depending on your preference. Just be sure there’s no moisture remaining. The process of dehydrating is much easier than other methods of preserving food, like canning. Usually, it takes less of your time and is a lot less messy, too. There are hardly any safety concerns and the dehydrator does most of the work. Another bonus of dehydrating is that fruits and veggies preserved at temperatures of 105 degrees or less are technically considered living foods, so they are more nutritious than cooked or canned. Plus, it’s a relatively inexpensive method, because dehydrators use very little electricity. 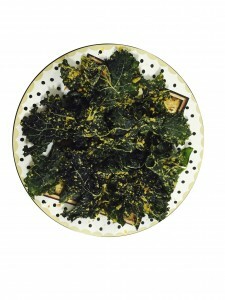 Overall, dehydrating is probably the most efficient way to preserve food to enjoy later. And, it makes the most sense because dried foods have a very long shelf life and can be stored for a long time without losing flavor or nutrients.